GILDEMEISTER energy solutions will be showcasing innovative solutions for renewable energy generation, intelligent storage technology and energy efficiency solutions tailored specifically for industry at the Intersolar Europe in Munich. Some of the products on display at GILDEMEISTER energy solutions’ 300m² exhibition area (Hall B5, Booth 250) include a CellCube FB 30-130 storage unit, a CellCube FB 200-400 and a SunCarrier 22. Intersolar Europe will be held from 19 to 21 June 2013. 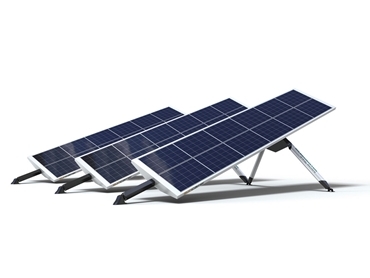 The SunCarrier 22 provides up to 35% more output compared to fixed systems. With up to 4.3 kWp per wing and low installation height, the SunCarrier 22 is a worthwhile investment for any photovoltaic application. The CellCube energy storage system provides emission-free energy based on Vanadium Redox Flow technology. Tested and proven in practice over many years, the CellCube provides an uninterrupted supply of electricity via solar and wind power plants - even in the dark and when there is no wind. Visitors to Intersolar can see a live demonstration of a CellCube FB 30-130 with a power of 30 kW and a capacity of 130 kWh. The CellCube is a stable electricity storage device with scalable system power for every situation. The CellCube FB 200-400 with 200 kW power and 400 kWh capacity provides tremendous energy reserves for widely differing applications and is recommended for industrial use. Examples of possible applications of the innovative energy storage device include grid support for stabilising low-voltage and medium-voltage networks, for example, as an energy reserve, or for smoothing peaks and compensating for load and generation peaks. However, the CellCube FB 200-400 can also be used as a backup solution when used as an in-line UPS with frequency and amplitude decoupling without detriment to the system. It can also be used as a buffer in wind and solar farms for smoothing the energy output and for compensating for fluctuations, or to provide contractual safeguards by way of energy reserves in times of reduced power. The exhibition will be rounded off by comprehensive information on the subject of solar park service and energy efficiency. GILDEMEISTER energy solutions offers planning and construction of solar parks, also providing its customers an individually tailored service and maintenance package that ensures smooth operation of the plant. GILDEMEISTER energy solutions also offers extensive services relating to energy efficiency, delivered by GILDEMEISTER energy efficiency GmbH, a company that was founded specifically for this purpose. This new company develops concepts and solutions for increasing energy efficiency for industrial organisations and, if required, installs the energy systems and storage devices all from a single source. GILDEMEISTER energy solutions is a DMG company. DMG MORI SEIKI Australia is a strategic partnership between two world-leading machine tool manufacturers, DMG and Mori Seiki.